We’re super proud of our fearless leaders, Matt Goebel, Carl Rodenberg and Josh Wade, for presenting to the NADCA conference in Phoenix earlier this week. They taught how to go from just a residential duct cleaner to an industrial duct cleaner and how to get into the business. Great job in a national spotlight! 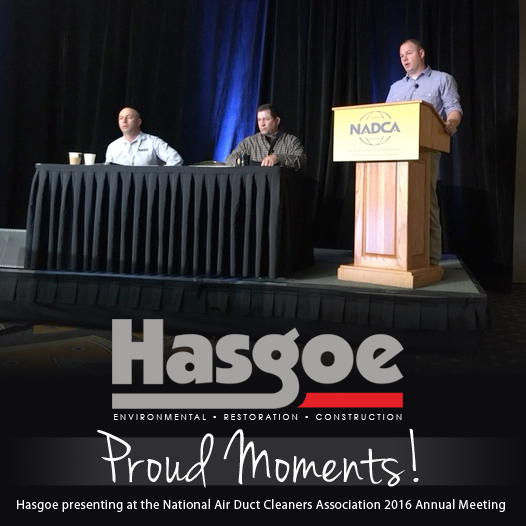 NADCA: The HVAC Inspection, Maintenance and Restoration Association, otherwise known as the National Air Duct Cleaners Association (NADCA), was formed in 1989 as a non-profit association of companies engaged in the cleaning of HVAC systems. Its mission was to promote source removal as the only acceptable method of cleaning and to establish industry standards for the association. NADCA has expanded its mission to include the representation of qualified companies engaged in the inspection, cleaning and restoration of HVAC systems. NADCA supports members’ success with standards, education, certification, marketing and advocacy to promote the highest quality and ethical services. The goal of the association is for its members to be the number one source for consumers and other entities seeking HVAC inspection, cleaning and restoration services, and air duct cleaning. NADCA’s membership continues to grow each year, along with its offering of training, education and certification. The Association is comprised of a diverse group of HVAC industry professionals, including air systems cleaning specialists, mold remediators, and HVAC inspectors. The association has also published important standards and guidelines, educational materials, and other useful information for the consumer and members of NADCA. Today, NADCA standards and certification are specified on a regular basis to ensure that HVAC systems are assessed, cleaned, and restored in a safe and efficient manner.